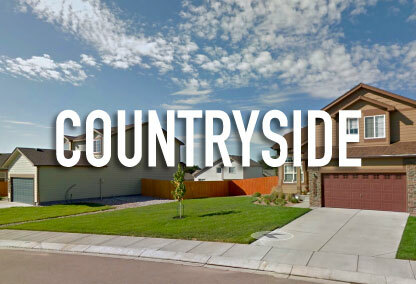 Midway Ranch is a unique neighborhood in Fountain, CO. The entrance is located at Midway Ranch Road and I-25, by Pikes Peak International Raceway. Homes in this neighborhood are built on large 5 to 40-acre lots that offer incredible privacy like no other neighborhood in Fountain. Midway Ranch is popular with the equestrian community in the area, as its a great place for raising horses and train for competitions. Most of the homes for sale in Midway Ranch are between 1,500 to 3,500 square feet in size and were built from the mid-1980s to now. Many of the roads are still dirt roads, with a few paved roads throughout the community. The snow removal is maintained by the neighborhood HOA. Midway Ranch has a small Homeowners Association that maintains the roads and water lines in the area. The fee is part of the water bill. This neighborhood is zoned to Hanover School District 28 with Prairie Heights Elementary, Hanover Middle School, and Hanover High School as the primary schools for the kids in the community. Midway Ranch is considered to be part of the Fountain MLS area within zip code 80817.